I began listening to shortwave in 1952 using a vintage 1943 Hallicrafters S-38. In the morning Radio Australia would boom in on 9580 kc and several other frequencies in the 25, 31 and 41 meter bands. Otherwise, European and African broadcasters targeted North America prime time. Radio Moscow was found everywhere on 30 to 50 frequencies from late afternoon through to late night. We had a 6 meter Gonset Communicator II with its matching 100w amplifier connected to a 4-element Telrex beam. 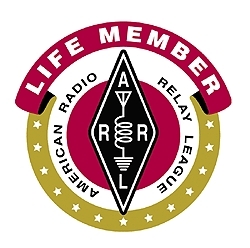 Though I was not licensed, as an SWL I participated in the ARRL International Geophysical Year (IGY) Propagation Research Project (PRP) headed by Mason P Southworth. The solar maximum taught me VHF propagation: days when EI2W and CT1CO started the morning off, and the F2 propagation would swing through Africa with VQ2PL making an appearance and by late afternoon KH6 and KL7 stations were dominant. The simultaneous double-hop E and F2 reception, signals reflecting off the aurora, doughnut hole, bent path and tropo made for interesting reception. The monthly PRP newsletters were an educational treasure trove. And I saw the most amazing aurora display ever, on February 10, 1958, so bright one could read a newspaper and drive without headlights; some 60 years later I learned that the aurora was seen in downtown Havana even though street lights were on. I joined the Newark News Radio Club in June 1957 (a member until its demise in April 1982 ). I wrote the "Information Please!" column (10/1967-5/1971, sandwiched between two terms as the Assistant BCB Editor (9/1963-12/1965 and 6/1971-1/1978). I was also a member of International Radio Club of America (1969-1976) and the National Radio Club (1970-1980). I learned medium wave propagation chasing stations in countries across the globe. I logged more than 1,400 stations in ~95 countries and ~47 states spread from Syria west to the Gilbert & Ellice Islands and south to Argentina. This aspect of the listening hobby lasted for 30 years. In 1961, an extra-curricular university activity, at its carrier current radio station, required me to have an FCC Restricted Radiotelephone Operator Permit (issued 26 Jan 1961) and, for communications while adjusting carrier current transmitters scattered about, a Class D CB license—2Q3671—and (upon renewal) KOG2427. An EICO radio installed in my 1953 Ford kept me company on the 21-hour mostly overnight drives to and from St. Louis via US40. Understanding radio propagation from longwave to VHF and UHF stood me in good stead upon getting my amateur radio license. — From 1968 Amateur Extra Class licensees, licensed for 25 or more years, could apply for a sequentially-issued 1x2 call. In 1976, Extra Class licensees could request a 1x2 call of their choosing; printed lists of available calls were distributed by mail. The program was phased out in four stages. The second and third stages of the program allowed those with progressively shorter time holding the Extra Class license to apply. The fourth stage was open to all Extra Class licensees. The one-year four-stage program ended in July 1977. In addition to our writings, I developed a dBASE program to load English language shortwave broadcast schedules into the Japan Radio Company NRD–525 communications receiver. The BBS was the distribution vehicle for the schedule updates. Over the years, the database format waa adopted by other software developers. Additional dBASE receiver control programs were developed for the JRC NRD–535 and NRD–545, the Kenwood R–5000 and the Lowe HF–150. All of the DOS–based programs eventually died as Microsoft Windows took hold, and I closed the software development piece of the business. My move onto the web in 1993 as TRS Consultants—still now found in web search results—covered my writing, software, shortwave listening information resources and website development. The website was closed in the 2000's as the website development business profitably declined. This website was put onto the web in 1994 to capture the myriad of collected Netscape bookmarks and reflect my interests in the stock market, investing and radio. Prior to W2XQ in the experimental radio service, 2XQ's history traces back to 1919, the Department of Commerce and Union College. Read more on the call's history here. Shortwave broadcasters, some dating back to the 1950s. Comments on a number of radios owned since 1952.